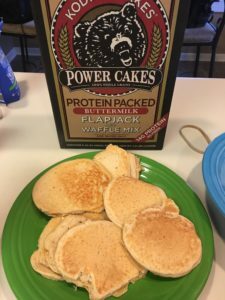 My meal prep…this works for me. 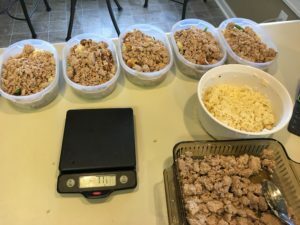 Since starting with a nutrition coach nearly 9 months ago, one thing quickly became abundantly clear….I had to plan if I was going to be successful. Meal prep has been the absolute key to me successfully losing 22 pounds and leaning out all over. Like many of you, I have a pretty busy schedule. My feet hit the floor at 4:30a.m. and they come off the floor at 8:45p.m. The hours in between are spent on coaching adult classes, training individual clients, coaching CrossFit Kids, programming, getting my own workouts in, among other things. I do not have time to worry daily with what I’m going to eat for any of my meals, so I get it all done on Sunday afternoons. We had our grandson over this past weekend, and not wanting to take any time away from him, I waited until later in the day to get our meals done. Steve left to take him home at 3p.m. so I started then. Wanting to make sure I finished in time to watch the Super Bowl, I had 2 hours to work with. I get a little better each week I prep, but it’s like anything else, it takes time to learn what works and what doesn’t. To keep it simple, I typically have the same thing for lunch each week, changing it up weekly. 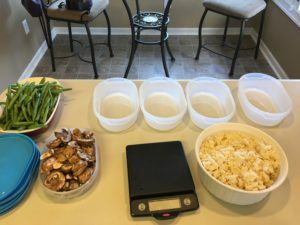 This week’s lunch menu consisted of, ground turkey, rice, green beans and mushrooms. We have a rice cooker that takes about 30 minutes to cook just about any amount. While the ground turkey is cooking, I load my vegetables and rice in my containers. Since I’m tracking my macro intake, my container goes on the scale and I use the tare function after adding each ingredient, making sure each day is the same. I track using My Fitness Pal so I enter the data one time and then copy it for each day of the week. This makes it so easy! In next is the cooked ground turkey and thats it, in the fridge they go and my lunches are ready for the next 5 days! 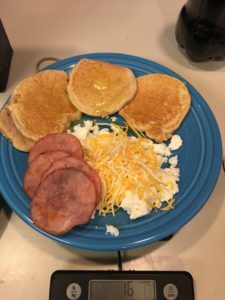 Breakfast is pretty simple for me also. Typically I will have 5oz of egg whites every morning, either 3 slices of turkey bacon or 4 pieces of Canadian Bacon. 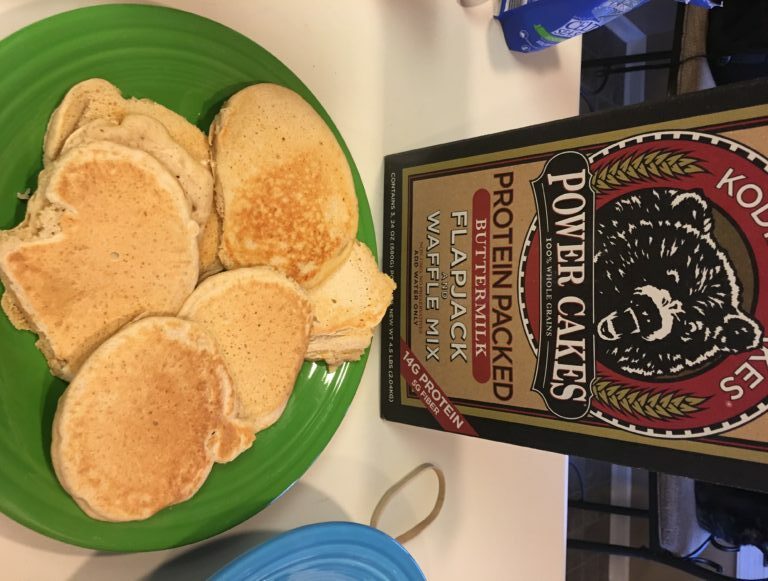 On heavy training days, I’ll have pancakes. On lighter training days, I’ll have a few slices of Pepperidge Farms thin sliced toast. I cook the egg whites and pancakes ahead of time as well. I’ll pop the pancakes in the toaster to heat them and that works perfectly. 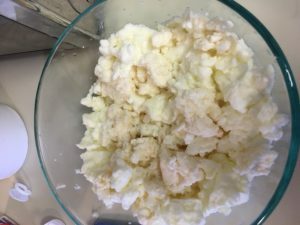 I’ll add a little shredded cheese to my egg whites or hot sauce depending on what my taste buds are up for. Enter in MFP, copy for the week and I’m all set! The last thing to prep is our dinners. 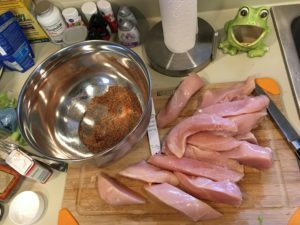 Often we get both of our crock pots going with chicken (seasoned differently). 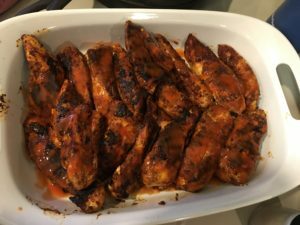 This week we decided buffalo chicken strips would be delicious! This particular recipe called for the strips to be skillet cooked. That took about 20 minutes. Most of my meal prep was done by the time Steve got back from taking Jackson home. 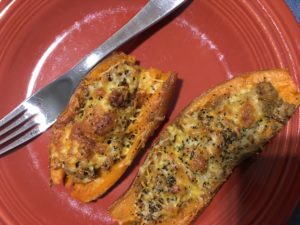 He wanted sweet potato skins for the Super Bowl so I had also preheated the oven and had the sweet potatoes washed and ready. He finished off that project and the leftover sweet potato we had for a couple of our dinners this week. We also added another vegetable each night. My advice for starting out is to keep it as simple as possible. I’m personally not interested in complex recipes or casseroles as they’re too hard to track in MFP. I like shopping and cooking in macros: carbs, fats, proteins. This allows me to be able to weight my food and keep it accurate. Depending on what your personal goals are, you may not need to go to the extent that I do, but this is what works for me! Share your meal prep ideas in the comments below! 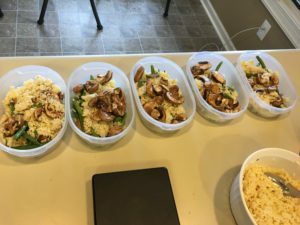 I have been meal prepping since i had my 5th baby and I have left 44 lbs! I love this article. One thing i love is my food is always there and I’m not too tempted. I can’t live without walden farms BBQ sauce and Hot sauce. Kudos on your work! Thank you and congratulations on your weight loss! You are so right! If food is always ready and available it makes temptation much less of an issue! I’ve heard great things about Walden Farms but have never tried them. I’ll check it out! !